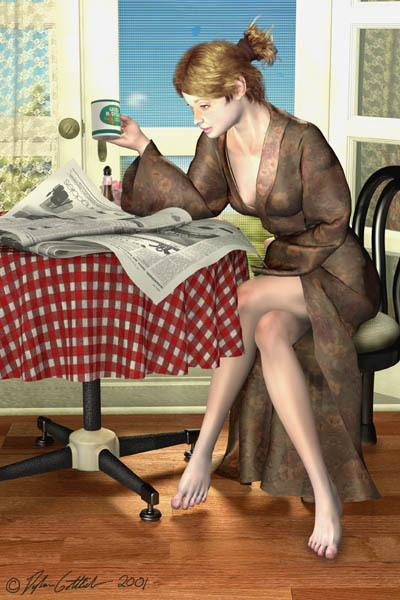 2001 - "Morning Coffee" Created in Maya 3.0. The woman was modeled in polygons; everything else was modeled using NURB's. The robe, tablecloth and curtains were all created using Maya Cloth. The womanâ€™s hair was made using Paint Effects. Textures were created in DeepPaint3D and Photoshop. 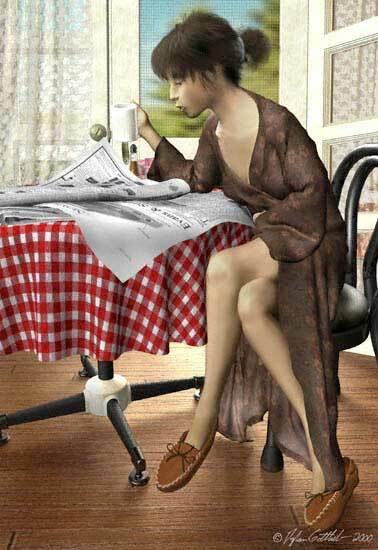 2000 - MORNING COFFEE - Created in Maya 2.5. The woman was modeled in polygons; everything else was modeled using NURB's. The robe, tablecloth and curtains were all created using Maya Cloth. The woman's hair was made using Paint Effects. Textures were made in DeepPaint3D and Photoshop.